Yesterday, after I wrote about the Performance Measurement Baseline for the PMP exam, I received an email asking about the Delphi Technique. I replied to the query, but then thought to expand it, and make it into a detailed article for your benefit too, as it is a common question on the PMP exam. Most of my students have told me that they got one or even a couple questions on the Delphi Technique in the PMP exam. What is the Delphi Technique anyway? When there are many experts, they all generally postulate their own theory, and it is often difficult to come to a common solution or a consensus. Experts tend to stick to their own views, and not prepared to accept other theories in favor of their own theory. Their ego often comes in between. And we can’t afford to hurt the experts or their egos… we really need their expertise. So what is the solution? Use the Delphi Technique or the Delphi method. 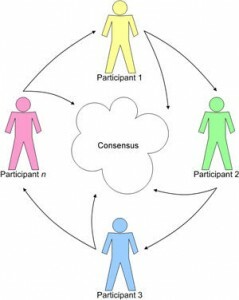 The Delphi technique is a quick way to reach a consensus for any decision making. In this method, all the feedback from the different experts is collected anonymously by the moderator. Then it is collated, summarized, and the most common solutions (say top 3 most common answers) are selected, and sent for further selection in a second round. In each round, the solutions get refined, and the least popular ones are dropped off by the moderator. Thus, the best solution is reached after a few rounds, without hurting anyone’s ego, or naming an particular expert or their school of thought particularly. Delphi is based on the principle that forecasts or decisions from a structured group of individuals are more accurate than those from unstructured groups. Where is the Delphi Technique Used? The Delphi Method is useful in 2 scenarios. When there are many experts involved, and consensus is not likely to happen quickly. When the experts are geographically spread out, and it is difficult to get them into a room to discuss, brainstorm and come up with the best strategy. Where is the Delphi Technique used for the PMP exam preparation? The Delphi method has been in existence for almost 80 years plus, and has been proven to be useful time and again. Thank you so much, it helped me anawer 1 queastion correctly!